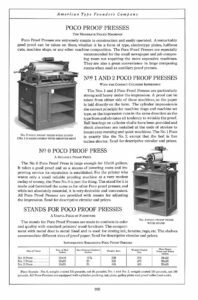 This page provides information specifically about Poco flatbed cylinder proof presses. Poco presses have reciprocating beds and stationary carriages. Patented by Walter G. Potter of Chicago in 1910, examination of the nameplates indicate that they were first manufactured by A.F. Wanner (1910–14), then Hacker Manufacturing (1914–1931). 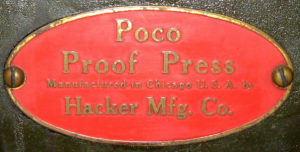 In 1931 Challenge acquires the Poco and Potter brands from Hacker; the 1935 ATF Catalog shows Challenge-Poco presses. No sources for parts are known and will need to be fabricated. However, questions posted on vandercookpress.info may be answered by Poco presses owners. are listed in the Poco census. See the post on A.F. Wanner. 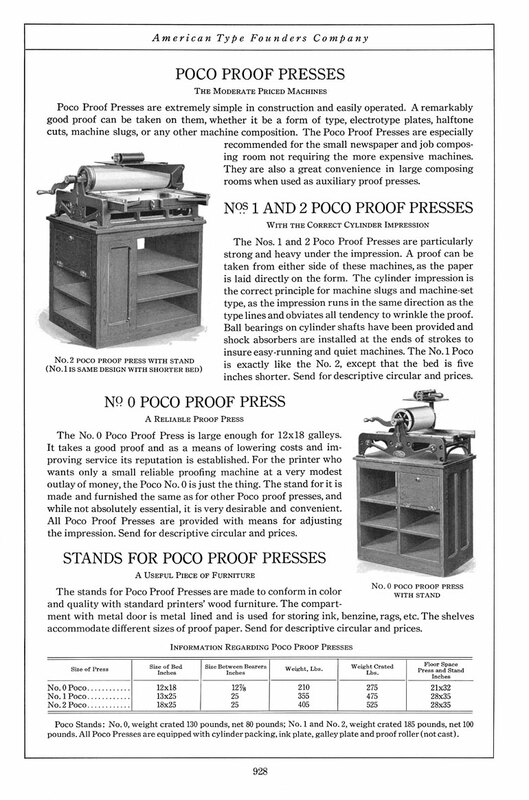 See also the website dedicated to Poco presses (last updated 2012). * Add 80 lbs. for a No. 0 Stand, and 100 lbs. for No. 1 and No. 2 stands.